I’m a fairly literate guy. I’m not afraid of multisyllaballatic words, I have a decent vocabulary, and I can write fairly well. So why have I never gotten into word games? I don’t enjoy Scrabble. Never have. The closest I came to was when my college buddy Jones and I played “Sounds Like” Scrabble, where you have to come up with not-words. Scoring was crazy high with bingos left and right, as the only restriction on a word was that a) it couldn’t be real, and b) you had to come up with a definition. But real Scrabble? Where turns take 30 minutes, the slightest skill discrepancy results in a blowout obvious after the first three turns, and a prerequisite for success is memorization of obscure two- and three-letter words? Where you’re always one tile away from that awesome word? Nope, don’t enjoy it. Not for me. And that was that, for awhile. I guess it was at a con in November of 2005, when I played a card game that was significantly influenced by Scrabble. I’ll withhold the name to protect the guilty, but I’ll say this: it’s awful. It has all the problems of Scrabble, plus arcane, counterintuitive rules, and the “feature” that someone else can play a card to cancel out one of your words. Ack! So an amusing thought came to mind: couldn’t I do better? People played this card game like crazy. Okay, maybe they saw something in it that I didn’t, but still, was this the best of all possible word games? As a lark, I threw together some rules and ran them by some players. Slowly but surely, I started realizing that I had an honest-to-goodness good game. 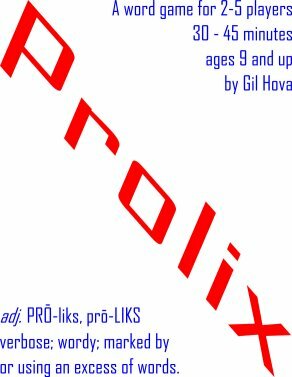 I’ve designed 3 games that are done or close-to-done, and of them, Prolix is my favorite. The main feature of Prolix, and the first thing I put in the game, was the idea that you don’t need all letters present in order to score a word. So there are a bunch of tiles out on a central board, and on your turn, you say a word. Any word. Okay, nothing capitalized, apostrophed, or hyphenated, but it’s so much less restrictive. And the words people come up with! Bacchalaureate. Ornithicopter. Words that you’d never see in Scrabble, or any other word game. This isn’t to say that the game was easy to design. On the contrary, it’s been a real pain in the tuckus. It’s an incredibly elegant game, which sounds like a boast, until you playtest the damn thing, and realize that anytime someone makes a suggestion, no matter how good, there’s no leeway in the ruleset to slide it in! I mean, if you’re designing a game that’s about the battle of the 5th Cavalry of Foontcawcil charging into the fray of savage Hoodkivliar barbains, and you feel that the Hoodkivliarians’ ranged attacks are a little underpowered, you can toss in a whole lot of rules to fix that imbalance. But in a simple word game, the slightest change, the slightest tweak, messes up the whole works. For example, one problem I had was that the game kept locking up. People would take forever on their turns, and it would drive me crazy that a game meant to be played in 45 minutes would take two hours. There were a bunch of ways I addressed this, but one of the easiest? I changed the number of letters out on the board. But wait! I quickly found out that if I had too many letters on the board, a player could immediately shout out “antidisestablishmentarianism” and get a decent score. There had to be enough letters so that there was at least one good word out there, but not so many letters that any stock big word would earn a respectful score. So tweaking the game has been a lesson in emergent complexity for me. Slight changes over here would result in massive changes over there. I’ve gained a huge respect for those simple games like Lost Cities and 6 Nimmt! that just seem to design themselves. So when will it be published? Who knows? I’ve had it at one publisher for a surprisingly long time, but I’ve already given them a November date as to when I’ll start shopping it to other publishers. I haven’t been able to get a game of Sounds Like Scrabble up… probably since the last time we played. I went through a Scrabble resurgence, and now have come back around to exactly your opinion, i.e. being rewarded for memorizing the two-letter word list is lame. I am REALLY interested in this Prolix of yours. I think it’s a game I might be able to convince Girl to play (Girl, alas, has no love for games, apart from occasional Scrabble, Set, or oddly, D&D). Can’t wait to hear more. OK, let me see if I can hook you up with a copy of the game. It all depends on my staggering laziness. I thought you’d been blogging all this time, and I was only catching up now. I think losing the Fanclub (Jones’ great forum, which I already miss) had a little bit to do with it. Nope, my blog before was all auto-pushed videos from the video hosting place. Almost never posted random blog entries. The forum was essentially my blog; one of the reasons I first contemplated shutting it down was the fact that a proper blog would be more accessible to strangers; the side idea was to maybe bring you and James in as guest bloggers, but then James started blogging a lot more on his own, and you started this, so the important voices of the forum are now all represented (better, imho). Meaning… something terribly important, I’m sure. Anyway, yeah, I only really started blogging the last week of September, when I was setting up the new website. Blah blah blah hello other readers I’m long-winded. I love Prolix. I can’t wait to buy it. Oh, and welcome to the blogverse! Thanks Carl, I can’t wait to sell it! I had the distinct pleasure of playing Prolix this past weekend at a local gaming event (“Recess”) and I LOVED it. I grew up playing games like Boggle, Scrabble and a homebrew dictionary game called “Fictionary” with my family, and after one session of Prolix I knew it would fit in nicely with my small arsenal of word games. I like that it’s quite different from any word games most fans of word games are already familiar with; it challenges your word power but in a very fun way that doesn’t drag on and on. It sparks word building creativity, but never feels inaccessible to the non-wordy. I hope it gets published, so that I can buy it!